The recommended replacement is the OW-IO-DIO8 Octal Discrete Input & Output. 8 channels, each configurable as an analog input, digital input, or digital output. Digital outputs, (4) sink 50-mA., (4) sink 8-mA. Wide operating voltage range, 8-16V DC. Built-in mounting spacers and Phoenix screw connectors. Second 1-Wire connector for easy net expansion. The T8D, 8 channel digital I/O expansion card, provides eight I/O channels which can individually be configured as a digital input with latch or a high current sink digital output. Digital input and output functions can coexist. The T8D has 4 built-in multidrop controllers (DS2406) which provide 4 unique 64 bit registration numbers (8-bit family code + 48 bit serial number + 8 bit CRC) assuring error-free selection and absolute identity; no two parts are alike. Unique addressing allows I/O function to be identified absolutely, no more dip switch address confusion. 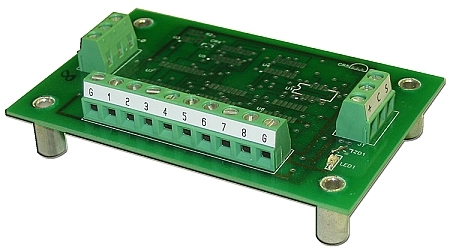 Status input, latched-input-activity and output-latch functions allow input, output and fast event catch functionality to hundreds of I/O points on a 1-Wire bus. DS2406s provide the digital I/O functions. The digital I/O functions 1-8 occupy connector positions 1-8 respectively. Positions at either end of the I/O connector marked "G" are ground returns. The T8D is designed to allow a network of input and output modules to operate on a two or three wire bus, power("+"), common("C") and signal("S"). The T8D can be powered locally or the power may be bussed with the1-Wire signal in a three wire system. The bussed power can be unregulated 8V to 16V DC. The T8D provides onboard 5-volt regulation for I/O operation. The onboard power supply has a very low quiescent current and low dropout voltage to allow long cable runs with minimum loss. The T8D can be stacked side by side for minimum panel space, or they can be spaced hundreds of feet apart to minimize digital signal wiring. The T8D is compatible with the EDS OneSix DDE server and family of 1-Wire enabled devices, as well as any 1-Wire host with support for the Dallas Semiconductor DS2406 Dual Addressable Switch and EDS Analog.